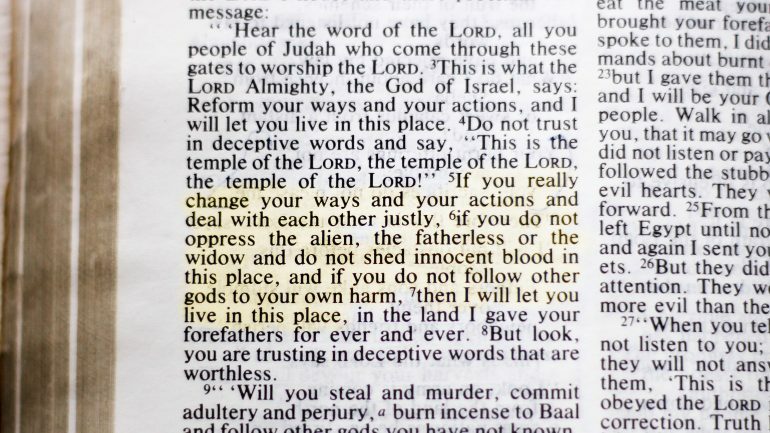 “For if you truly amend your ways and your deeds, if you truly make fair judgment with one with another, if you do not oppress the foreigner living in your midst2, the fatherless, or the widow, or shed innocent blood in this place, and if you do not go after other gods to your own harm, then I will let you dwell in this place, in the land that I gave of old to your fathers forever. 1. In the book of Jeremiah, this phrase is “This is the Temple of the LORD, the Temple of the LORD, the Temple of the Lord!” This was the response of the people of Judah when Jeremiah told them that the judgement of God was coming upon them for their unfaithfulness. The response indicated something like, “How can judgement come against us? We have YHWH’s temple in our midst, the very sign of God’s presence, so God must be with us!” They didn’t understand that the ceremonial practices of civil religion were not the true religion that God sought and commanded: taking care of aliens, widows, orphans, practicing justice, and abstaining from idolatry. 2. The phrase “foreigner living in your midst” is represented by one word in Hebrew, ger (גר). This word is sometimes translated as “alien” or “sojourner” in English versions. It represents someone of foreigner birth living in another nation, often as a refugee. God, in the Torah and the prophets, repeatedly commands not only the care and concern for the ger, but for Israel to remember its identity as ger itself.